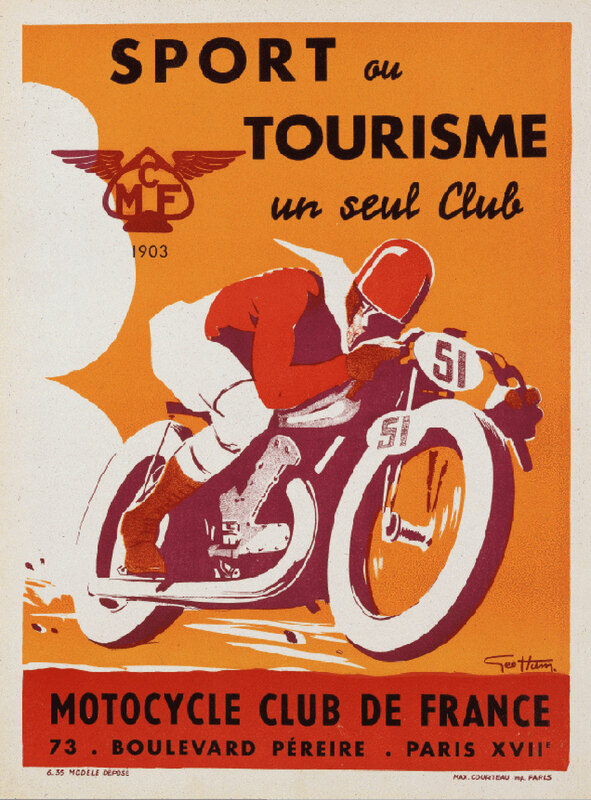 This entry was posted on Friday, December 21st, 2012 at 3:19 pm	and tagged with french motorcycle poster, geo ham, motorcycle racing poster, vintage motorcycle, vintage motorcycle poster and posted in Motorcycles, Scooters & Automobiles, Posters and Ephemera. You can follow any responses to this entry through the RSS 2.0 feed. There are two versions of the original poster. One without any writing and one with the text for the Motocycle Club de France. They blank stock poster was designed for events, where they would print specific information about the event. The other was to advertise the club. There is considerable debate as to whether there have been reprints on older paper, but that debate exists for many European posters of all ages. If you have found this poster and the dimensions are correct (11.25″x15.75″ approx) it is likely “vintage”. If you have the opportunity to look at the paper, and can verify that it has some age to it, or can look at the back to see that the screened ink has bled through, then you are in good shape. If you cannot see the paper or the back then you must be careful. There are a lot of people reproducing this on eBay and it will always be on white paper, not aged. The paper was originally quite thin and a bit brittle around the edges. The original will always have the name of the printer in the lower margin (Max. Courteau Imp. Paris & Modele Depose). Some of the reprints do not have this. Once and a while you will find an original mounted on linen. Usually these are from a reputable dealer and are more expensive because of the mounting process. As always, if the price is too good to be true than it is not true. If you are lucky you will find them in the $100 – $200 range. Sometimes they command much more, up to $500. I hope all this helps.